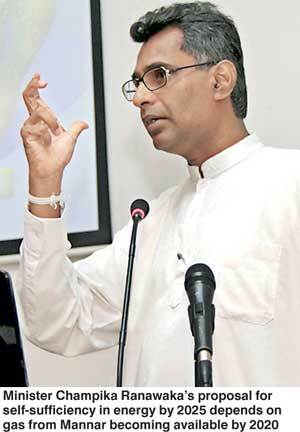 Minister of Power and Energy Patali Champika Ranawaka in presenting ‘Sri Lanka Energy Sector Development Plan for a Knowledge-based Economy, 2015-2025’ informed the public of an impressive goal of reaching 100% energy self-sufficiency by year 2030. The Ministry has embarked on an ambitious action plan and as the first phase, proposes to provide electricity access to every citizen in Sri Lanka during the year. The Minister’s vision is presented as challenges, potentials, targets and an energy policy with a view for a cleaner future through green energy. Highlights of Minister’s proposal and the challenges ahead are discussed below. 1. To make Sri Lanka energy self-sufficient by 2030. 2. Improve power generation with renewable sources from 50% in 2014 to 60% by 2020 and full usage in 2030. 3. Increase generation capacity from 4,050MW to 6,400MW by 2020. 4. Generate minimum of 1000MW of electricity using gas discovered in Mannar. 6. Provide 100% electricity coverage to citizens. 7. Reduce petroleum usage in transport sector by 5% using electricity in transport by 2020. 8. Produce entire petroleum requirement through our refineries by 2025. The achievement of energy self-sufficiency is based on the utilisation of Mannar Basin’s gas discovered in October 2011 by the Indian oil company Cairn. However, the Government failed to reach an agreement with Cairn for the commercial development and production of discovered gas, or to enact required legislative measures and build physical infrastructure to enable usage of gas. The Minister’s plan envisages generation of 1,000MW of electricity using gas from Mannar and conversion of oil burning power plants to operate on gas. The plan envisages promotion of renewable energy applications. Renewable energy is that comes from resources which are naturally replenished by sunlight as wind, rain, tides, waves and geothermal sources. Our current renewable energy is derived mostly from hydropower, wind and solar power, also bio-mass (cultivated timber) is used for power generation. Some affluent families have installed solar power for generating electricity in their houses, while exchanging power with CEB and paying for the balance usage (nett-metering). Widespread usage has been restricted by high initial costs. More common is the solar water heater. Walking paths in newly developed public areas have been illuminated with solar power, enlightening public. In mountainous remote areas, community hydropower plants supply limited electricity to isolated villages. Some isolated large farms use solar power for pumping water for irrigation. During British rule number of tea and rubber estates generated own electricity with small hydro power plants, until CEB encouraged factories in 1970’s to close down generating plants and shift over to CEB power. Biomass sector has not received separate mention in the booklet, although the sector deserves special attention. Biomass projects generate power by burning branch cuttings of plants (mostly grilicedia) collected from rural farmers and paddy husk produced when milling paddy. Most power plants are located in the rural sector; provide employment and income opportunities to growers and transporters. Grilicedia plant roots are known for its nitrogen fixing abilities, leaves as animal feed, rots easily and excellent manure. By 2020, biomass plants are expected to supply 153MW of power to the national grid. Sri Lanka’s highlands have numerous streams suitable for generation of hydro-power. 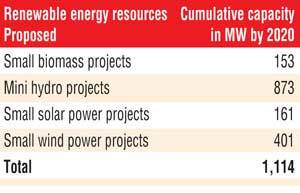 While large projects are CEB’s domain, smaller projects up to 10MW are allowed to be developed by the private sector. The generating capacity of current small plants in 2015 total 293 MW, out of a total possible generation capacity estimated at 873MW. Biomass and mini-hydro plants are developed and run by local private organisations under State control. The approval procedures especially on environmental concerns are extremely cumbersome and would interest public especially with the Port City project under investigation today. Some of the procedures required for the acceptance of a hydro project are summarised below. When a developer discovers a possible location for a hydro-power plant, he would conduct investigations and study the viability of the location. If satisfied, would submit an application to Sustainable Energy Authority (SEA). SEA if satisfied would issue a provisional approval (PA) for development. With the PA, developer will apply for a Letter of Intent from CEB and environmental approval from Central Environmental Authority (CEA). CEA may refer the application to another authority most relevant to act as Project Approving Agency (PAA). (In Port City’s case PAA was Coast Conservation Department). PAA sets in scoping meetings with government agencies from which the developer needs to get approval for the project, including no objections from Grama Sevaka and Divisional Secretary, who would call public meetings. PAA also will issue terms of reference (TOR) for an initial environmental examination report (IEER). The developer submits the IEER to PAA along with other approvals, which are evaluated by the technical evaluation committee appointed by PAA. If accepted environmental clearance is issued to SEA for the Energy Permit (EP). With the receipt of EP, the developer is permitted to commence physical construction at the proposed site. The developer would submit an application from Public Utilities Commission of Sri Lanka (PUC) for Energy License and sign a Power Purchase Agreement with the CEB. The electricity rates payable to private power generators are fixed by the Public Utilities Commission. Due to misunderstandings CEB has refused to accept rates fixed by the PUC and the matter even reached the courts. Meanwhile, for years CEB refused to sign power purchase agreements with developers, effectively stopping all developments. Now, the problem has been sorted and CEB accepts power proposals. According to power purchase forecasts by the CEB, additional power purchases from the private sector is programmed as 20MW for 2015 and 2016, 25MW each per year from 2017 to 2021, 20MW in 2022, 15MW in 2023, and 10MW each for 2024 and 2025. Today, every possible location for mini-hydro generation has been identified and private developers are interested in immediate implementation. But will the CEB be willing to accept more power than their program. The quicker implementation of all possible hydropower projects, mini or otherwise would benefit the country. But past public experience is powerful public organisations as Water Board and CEB are a law onto themselves; solved only by the intervention of the Minister. According to the report, today’s total installed power generation capacity amounts to 4,050MW consisting of 900MW from coal, 1,335MW from oil burning thermal, 1,375MW from hydro and 442MW from non-conventional sources as wind, mini-hydro, bio-mass and solar. The capacity is expected to be increased to 6,400 by 2025. The increase is expected from Sampur coal plant (with India) 500MW, Biomass fired thermal plants 1,200MW, Mannar wind farm 100 MW. Among the hydro power projects planned during the near future are Seethawaka Ganga 20MW, Moragolla 30.5MW, Broadlands 35MW and Uma Oya 120MW. Among possible projects is the second coal fired plant at Sampur generating 500MW and 375MW wind power project in Mannar. The Minister’s proposal for self-sufficiency in energy by 2025 depends on gas from Mannar becoming available by 2020. However, a recent report claims Cairn India has withdrawn from Mannar Basin natural gas exploration following the global petroleum price slump. Cairn had indicated pulling back from exploration worldwide; and wants to focus on enhancing oil production from their field in Rajasthan, India. If Cairn were to withdraw, the Government would be forced to negotiate and agree with a new investor. With the price slump of oil due to large scale exploration of shale oil in the US with advancement of fracking techniques, it is forecasted that world oil prices would stabilise around $80 per barrel, resulting gas deposits in Mannar being deep may become uneconomical. Normally, time period from discovery of oil/gas to practical use takes around six years. We have been stagnant for four years. The Minister of Power and Energy wishes to expedite the process. Until output sharing terms are agreed between the investor and the Government, the exploration of other blocks also will not materialise. But most important is the planning and development of legal and physical infrastructure for the usage of gas. These aspects would include relevant legislation, would only be possible after discussions and agreement with prospective handlers, storage, distributors and users of gas. The Minister has a vision for the future, but the practicality of the proposals and problems in implementation could be gauged by past happenings. In executing the proposals, the Minister will have to depend on the CEB and mutual relations would be vital for proper achievement. Let us look at some of the past records. In the 1980s, contrary to most expectations, Accelerated Mahaweli Project could not cope with the rising power requirements and the necessity of a coal-fired generating plant was accepted; the problem was the location. The most suitable location was Trincomalee, but due to ethnic problems, the Trincomalee was considered unsafe. As an alternative CEB came across Mawella/Kudawella near Tangalla in the Hambantota District. Eng. Carlo Fernando – at a public seminar in 2000 informed: “I examined Mawella in the 1980s and found Mawella Bay, a natural harbour with nearby deep sea, capable of allowing large coal ships of 60,000 dwt to be handled.” The location was confirmed by Sir Alexander Gibbs & Partners, world recognised consultants. Shortly after suitability was declared, locals held demonstrations at Mawella, against the power plant, that they would be expelled to make way for the project. It was later learned that the demonstrations were instigated by external parties who misguided the locals. President Premadasa, upon hearing of protests, without investigation in depth, ordered CEB to look for another location. Later, the local Pradeshiya Sabha passed a resolution requesting the power plant be located at Mawella and they would assure fullest cooperation, but CEB was not interested. After rejecting Mawella, Secretary to the President, appealed to Japanese Government for help, resulting in Japan Consulting Institute conducting feasibility studies. They recommended the locating the plant at Dungalpitiya in Negombo or Norochcholai. Studies showed that construction costs at Norochcholai would amount to $ 2,279 /kw vs. Negombo at $ 1,880 /kw, costing additional $ 120 million for the 300 MW plant at Norochcholai. Also, the sea at Norochcholai being shallow would require unloading coal in mid-sea. But CEB selected Norochcholai in spite of all opposition. Commencement of plant was delayed due to opposition from Bishop of Chilaw and others, until the election of President Mahinda Rajapaksa. Since late 1980s, while the location of the coal power plant was under debate, CEB did not consider it to be prudent to reconsider Mawella, or even Negombo locations. With power cuts in early 1990’s it was easy to get government acceptance on diesel-based generating systems, the most expensive power-generating fuel. These power plants owned by the CEB as well as private companies produced electricity at a high cost, was passed over the consumer. When President Rajapaksa wished to take a decision on Norochcholai, CEB did not present him the complete picture on Norochcholai, Mawella and Negombo, including relocation of affected persons, construction and running costs, and the resolution passed by the Weeraketiya Pradeshiya Sabha agreeing to locate the project at Mawella. If President Rajapaksa was made aware of the complete situation, he would have certainly selected Mawella. With the construction of Polgolla Dam, part of the Mahaweli water was diverted to fill Kalawewa and Rajangana Wewa, while balance waters generated power in Victoria, Randenigala and Rantembe power plants. Diverted waters at Polgolla produce 80 MW and the non-diverted waters are capable of producing 386 MW of power. Thus for the production of electrical power, the most profitable option would be to divert only the absolute minimum quantity at Polgolla, allowing the majority of water to be used for power generation. The quantity of water diverted from the Mahaweli is vastly beyond the requirements of paddy cultivators, to the extent when rains arrive, tanks in Anuradhapura District overflow creating floods, as tanks are already filled with Mahaweli water. In reality, for the best part of the year Victoria Reservoir remains practically empty, producing only a fraction of the electricity capable of generating. But Kalawewa is kept substantially full almost all the time. In 2014, north central province received Maha rains in latter part of September ending one of the worst droughts. But by mid October, Rajangana tank was overflowing creating floods. Flooding of Rajangana and Anuradhapura tanks occurred several times during the October to December period. However, during the period Victoria spilled only once. Even in 2015 mid-April, Rajangana tank has been spilling for over a week. The unfortunate situation created by the diversion of excessive quantities of water from Polgolla beyond the cultivation requirement, continues to deprive power generation. For decades, some senior staff in CEB at commanding positions has been deliberately driving the organisation away from cheaper ways of generating electricity, towards usage of the expensive thermal power. The sabotage of location of first proposed coal-powered plant at Mawella, selection of more expensive location at Norochcholai over Negombo and continued sit back attitude when Norochcholai was opposed confirms the statement. Controllers of Polgolla Dam, by diverting excessive quantities of water, created an artificial shortage of water at the Victoria Reservoir over the years. When Victoria dam was built, the British engineers informed that Victoria was capable of producing further 210MW of power, but first, river flow need to be controlled by building Kotmale and Upper Kotmale dams. The designers of Victoria kept provision for the Stage 2 and only minor construction works and power plants are required. However, over the past 35 years CEB engineers failed to implement and generate additional 210MW of power. The transfer of excessive water from Polgolla diversion to the extent of creating floods is a manoeuvre calculated to sabotage the possible implementation of Victoria Stage II, capable of generating further 210 MW of power. The above shows how country’s electricity power generating capacity has been deliberately kept under stress. 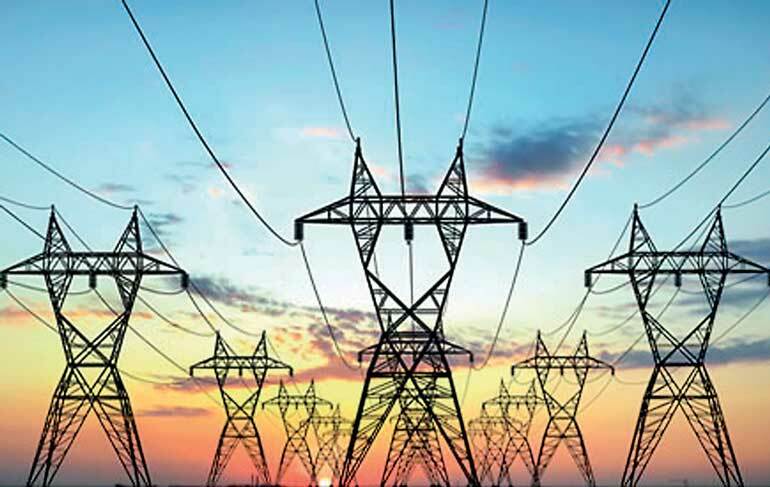 Due to delays in construction of coal power plant, power shortage resulted power cuts, urgent contracts were awarded to Private Power Developers (PPDs). Some power purchase agreements committed CEB to purchase power at rates exceeding Rs.30 per unit and for some for over a period of 20 years. Is it a wonder why electricity charges for the Sri Lankan consumer became most expensive in the world? With the delay in implementation of coal power plant and diversion of excessive quantities of Mahaweli waters, power generation dropped and the balance requirement had to be purchased from PPDs. Results were felt by the hapless consumer in way of power cuts in 1990’s and the world’s highest tariffs, which only came down recently, when Norochcholai second stage came into operation. The Minister’s wish for self-sufficiency in energy need to be implemented through State organisations and CEB has a huge role to play. The past record of CEB would indicate the Minister of the challenging times ahead. While large projects involve massive funding, smaller projects as biomass and mini-hydro are implemented by the local private sector with own funding. Their total outputs would be small compared to large projects. Almost all mini-hydro locations have been identified and need not be delayed to suit CEB’s program. Earlier implementation of all available locations would benefit the country. The diversion of water at Polgolla needs serious attention and proper controls would allow sufficient water for Victoria Stage 2. A World Bank study in the late 1970s revealed that Sri Lankan farmers use the highest quantum of water in the whole world. Now we have spoiled the farmer so much that consumption has gone still higher. When the world is facing a shortage of water, our farmers should be controlled and lowest cost power plant at Victoria 2 should be implemented. ng for self-sufficiency in energy, but with CEB’s past record, getting the program implemented would take courage and the country will look forward for the program’s success.